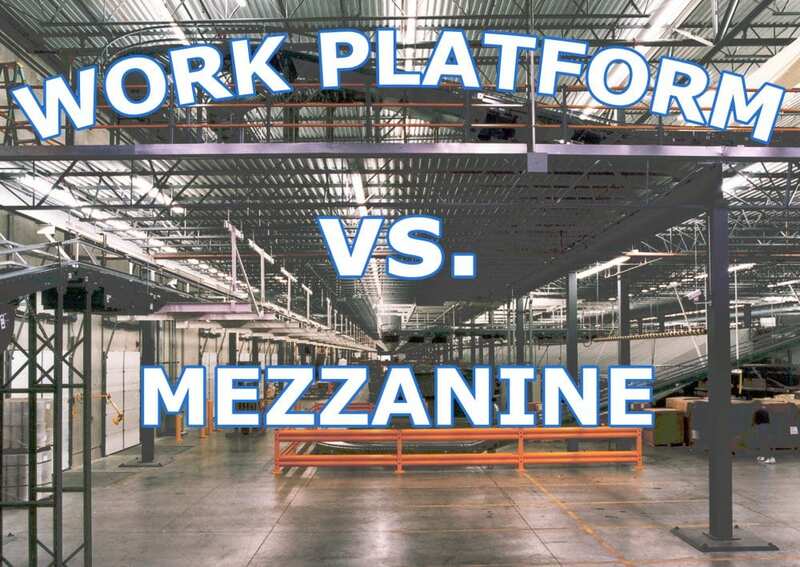 What is the difference between a work platform and a mezzanine? The answer is Permanence. With regard to the codes and permit process, a mezzanine is considered to be a permanent intermediate level within a building, and considered a part of the physical structure. For example, think about a theater and the balcony section. That balcony level is usually built into the structure during the construction of the building. On the other hand, an elevated work platform is a piece of equipment. Work platforms are often installed to increase a facility’s usable space, or provide convenient access to materials and equipment. In addition to a less stringent permit approval process, installing a “work platform” also comes with tax benefits we’ll cover later. Our industry is beginning to see a move from using the word mezzanine to using the term “work platform”. We’re finding using the word mezzanine can muddle the permit process. The building codes and permit officials often interpret a mezzanine to be part of the building rather than a piece of equipment. The confusion stems from the word itself. Buildings can be constructed with a “mezzanine level”. That type of mezzanine is not the kind Beaton Industrial sells. When this misinterpretation occurs, it can cause expensive modifications in building plans, including the possible need to add bathrooms, handicap accessibility, elevators, and potentially higher tax rates. To avoid this potential misinterpretation, Beaton Industrial recommends our customers use other terms when speaking with all parties involved, from the architects, to the insurance agents, to the building inspectors. Some replacement words include, Work Platform, Equipment Platform, and Elevated Structure. The verbiage does not change anything with regard to the design, or how the platform will be utilized; it simply helps prevent a misinterpretation of the structural permanence of the platform. Work platforms are viewed as capital equipment. This offers the ability to depreciate the purchase over 7 years vs. 31 years. Lower assessed value and taxes – Platform space is not counted with regard to total square footage. So the moral of the story is be careful which word you use to describe your structure. Using the wrong term can cost you valuable time and money. If you are thinking about purchasing a work platform and would like to receive a quote, fill out the quote request form here.